I’ve been looking for this one for quite a while and two weeks ago I finally managed to succesfully track one down and purchase it. It’s the European version of Ultra Magnus that was available in mainland Europe in 1987 (though most likely only in France, the Benelux countries and Switzerland). Check it out! 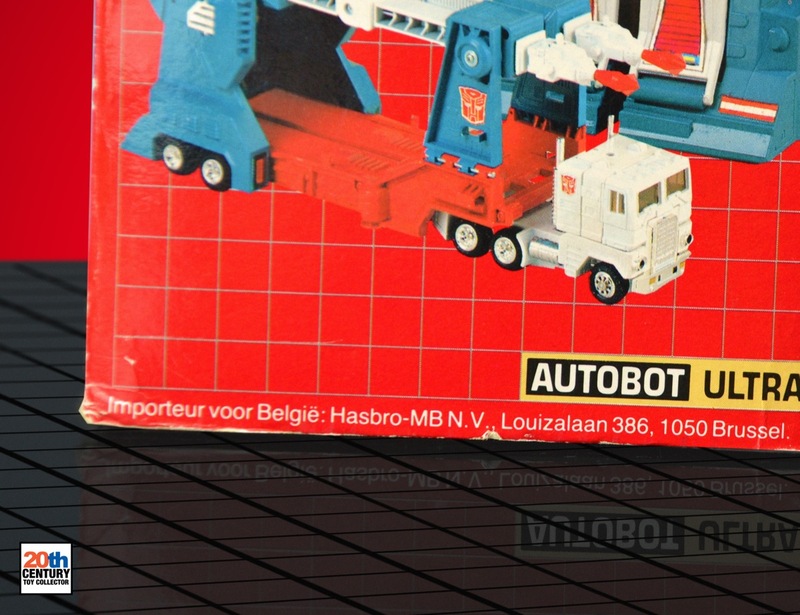 I already have a worn UK version of Ultra Magnus in my collection since ages ago, but it was only a couple of weeks ago that a first potential deal for a European Ultra Magnus presented itself through a Belgian seller. Unfortunately the deal fell through and I thought I would probably have to wait another couple of years for the next one to turn up. Fortunately for me it was only a couple of weeks later that I found another specimen right here in the Netherlands and I quickly snapped it up for a very reasonable amount (100 EUR). Ultra Magnus was introduced in the 1986 animated feature “Transformers: The Movie” as Optimus Prime’s replacement as leader of the Autobots. He would hold that title only shortly, before being relieved of command by Rodimus Prime. So much for the cartoon continuity. In the toy line Ultra Magnus’s rank is that of City Commander (the city referred to here being Autobot City). 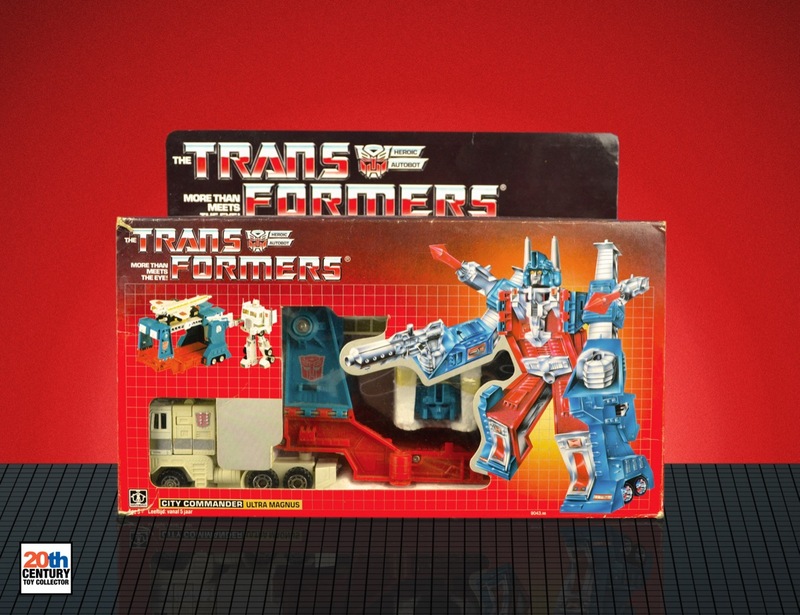 The origins of the Ultra Magnus toy can be traced back to the Japanese Diaclone toy line where he was known as Powered Convoy, with a slightly different colour scheme than the red, white and blue Ultra Magnus we all know and love. 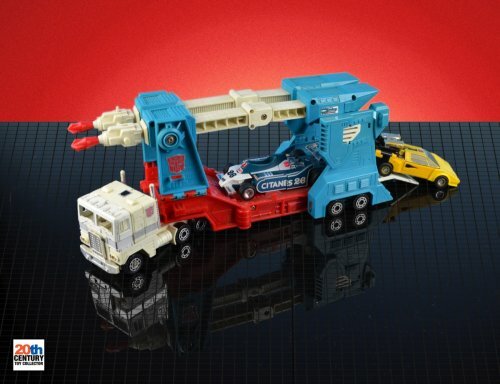 Ultra Magnus can transport several Autobot cars simultaneously, which made him a great addition to most kids’ Transformers collections. 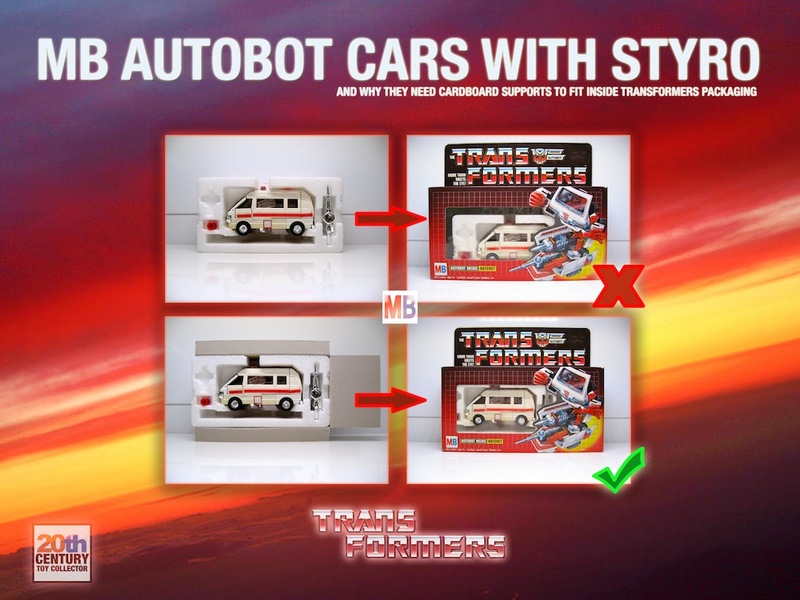 I’m a sucker for comparing the differences between the European releases of Transformers to the original American releases and trying to piece stuff together about the production and distribution of the toy. The first thing I did was to compare the toy itself to the UK release I had lying around, which is basically the same as the American release I believe. As I expected there were virtually no differences in the molding between the two. 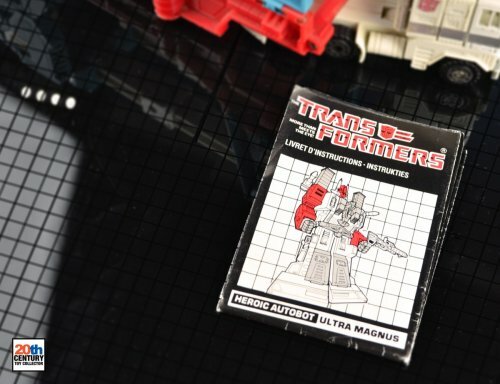 Both the American/UK version I have and this European release of Ultra Magnus were manufactured in Macau and the packaging was printed in Hong Kong. Unfortunately this means that we’re dealing with an Ultra Magnus with plastic wheels instead of the rubber tires we can observe on the packaging. A sad but understandable move to keep production costs down I guess. 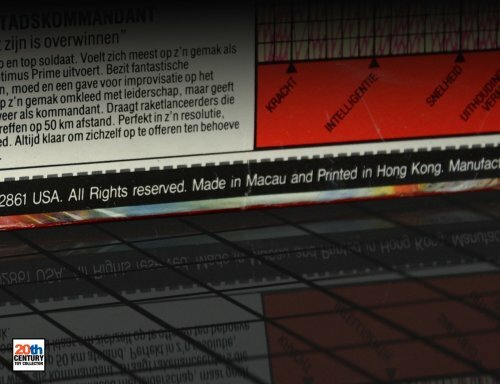 Takara and Hasbro had outsourced a lot of production to Macau in 1986. Earlier versions of the Ultra Magnus toy came with rubber tires, more chrome and a painted head. This release feels a lot cheaper in comparison. Because this particular Ultra Magnus I just bought was only released in 1987 I think this is the only version that was ever sold here, meaning it’s unlikely that the rubber tires version of Ultra Magnus was ever sold in this European packaging. 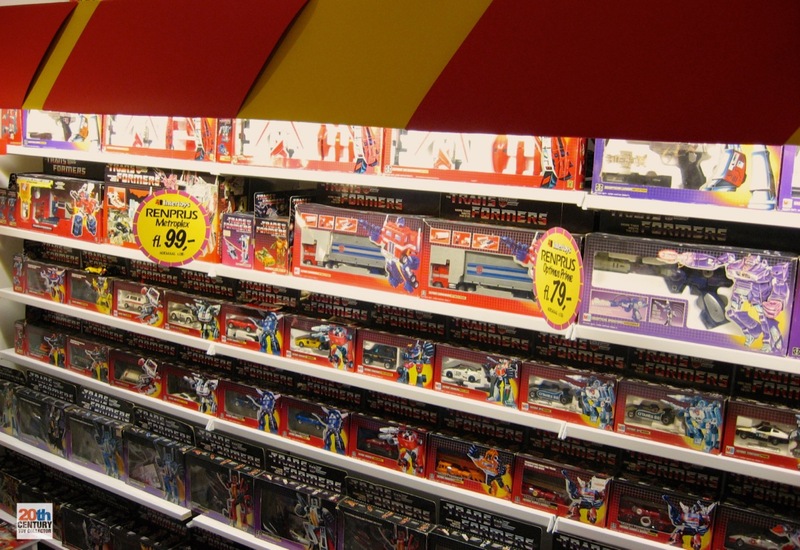 Things were still seriously out of sync back in 1987 in mainland Europe as far as releases of Transformers toys were concerned. Basically we saw most of the 1986 US releases here, but some of those we got in 1986 and some of those were only released in 1987. E.g., while the US got bots like Galvatron, Trypticon, Wreck-Gar, Sky Lynx and Ultra Magnus in 1986, for some reason those were pushed back to a 1987 release in most of mainland Europe (the countries where MB did the distribution of Transformers). It was weird and confusing. 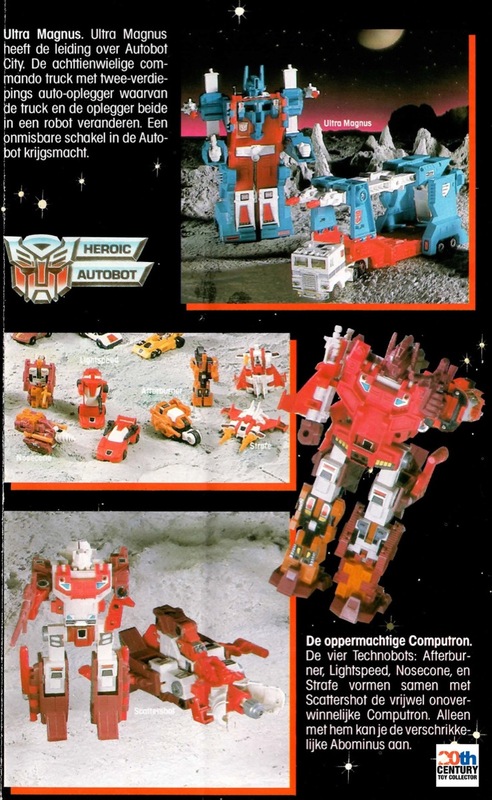 Here’s a page from the Dutch 1987 Transformers catalog that MB International BV produced and distributed as an insert inside the weekly Donald Duck magazine, issue number 40 released early October, 1987. 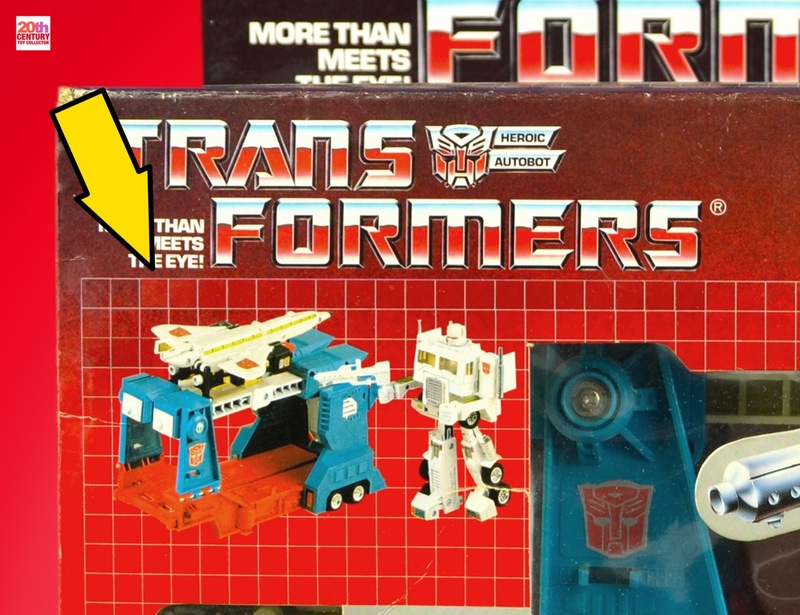 It shows Ultra Magnus (a 1986 toy in the US), together with the Technobots (1987 toys) on the same page. Another example of this fine mess is the European release of Metroplex and his Decepticon counterpart Trypticon. The US saw both Metroplex and Trypticon released in 1986, but for some reason the powers that be decided that most of mainland Europe got Metroplex in 1986, but Trypticon would have to wait until 1987. 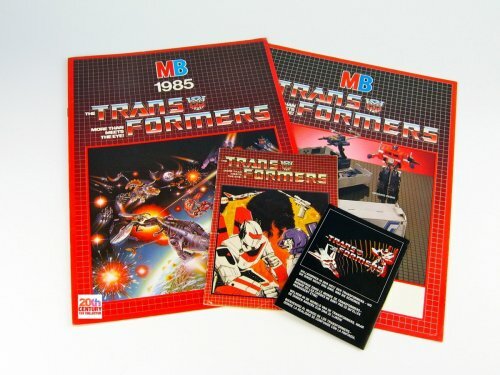 Up until 1987 all the (mainland) European Transformers releases came with quad lingual packaging. The four languages at the introduction of Transformers in Europe in 1985 were German, French, Dutch and Spanish. 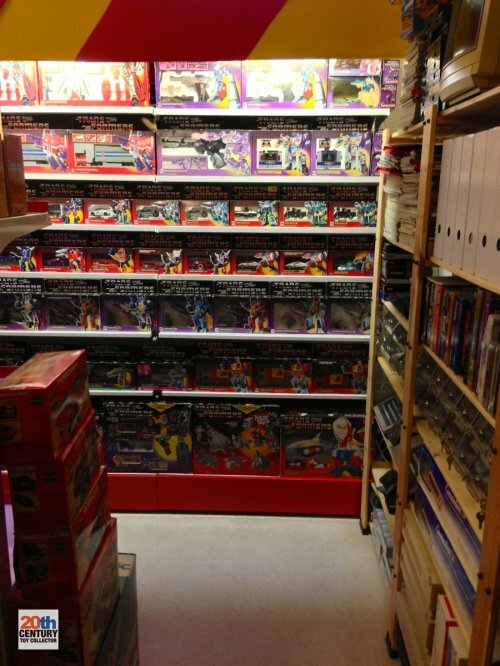 In 1986 some Transformers toys saw German dropped in favour of English, presumably because Transformers were not the big hit Hasbro/MB had expected it to be in West Germany. As you can see from the age notice on the packaging in the photo above, 1987 marked a notable change in this policy and European Transformers suddenly came in bilingual packaging, with only French and Dutch as the languages of choice. I assume that non-French/Dutch speaking territories in Europe will have gotten the regular US / English language packaging, perhaps with an added sticker with the distributor contact information. 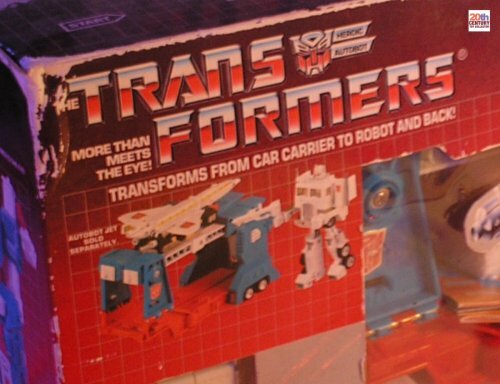 An interesting side effect to this switch from four languages to a more manageable two languages on the packaging is that it was now finally feasible to include the actual bio of the Transformer. US packaging already had the tech specs and bio details since the line’s inception in 1984, but because the continental European releases needed to have evertyhing in four languages there was no room for a bio on the tech spec card, so we had to make do with just the Transformer’s motto. This changed in 1987 with the switch to bilingual packaging as you can see in the photo below. Ultra Magnus’s bio is included in both French and Dutch. The name of the distributor for Belgium is Hasbro-MB NV, which was actually a subsidiary of the Dutch MB International BV (MB International BV had several subsidiaries in Europe). 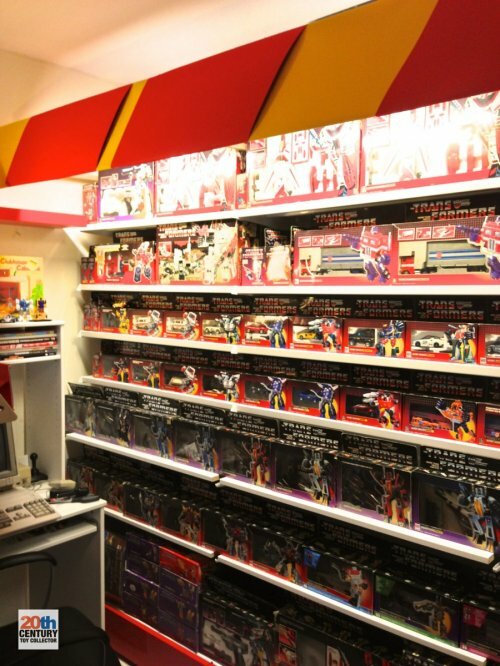 The Belgian Hasbro-MB had their sales office in Brussels. 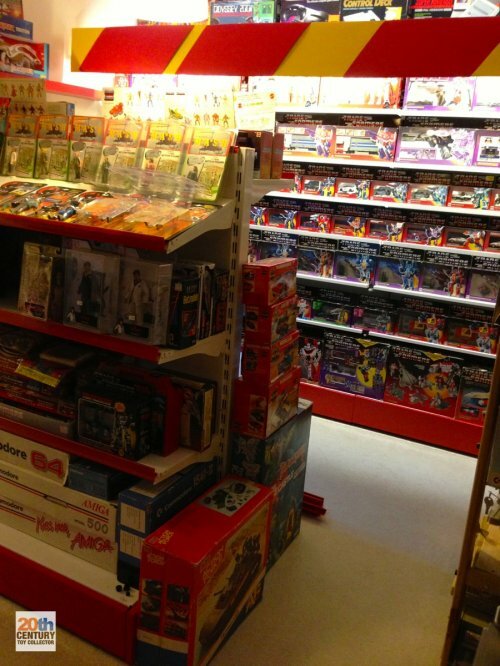 Belgium did not have any other MB offices, because it was being supplied with Hasbro, MB and Playskool products directly by MB International BV’s warehouse in Ter Apel, Netherlands. 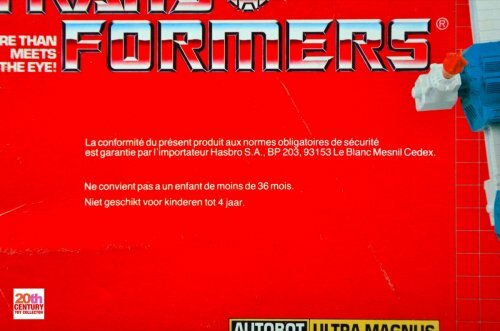 Here we find the standard obligatory French legal blurb and now the name of the distributor is Hasbro S.A. with their head office in Le Blanc Mesnil, north of Paris with distribution done from the MB warehouse in Le Bourget-du-Lac, close to Lyon. Pretty muddy isn’t it? 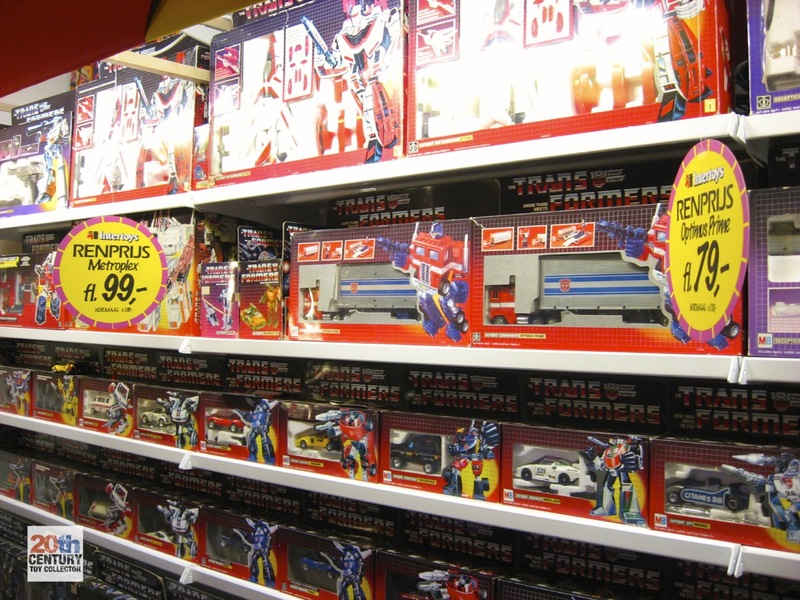 Although Hasbro and MB had merged in 1984, the way the new European Hasbro and MB operation presented itself to customers (and even retailers!) varied from country to country. 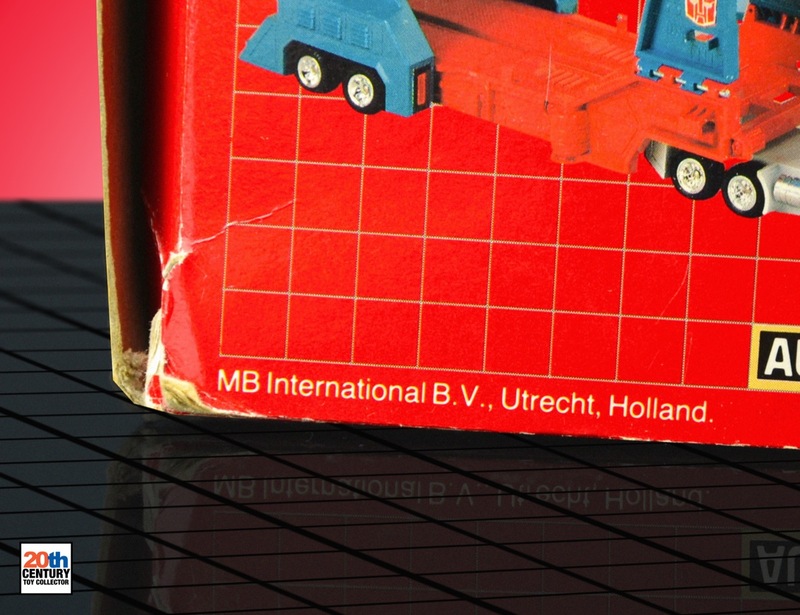 Three countries where this particular product is distributed and the contact information for every one of those uses different names: “MB International”, “Hasbro-MB” and “Hasbro”. 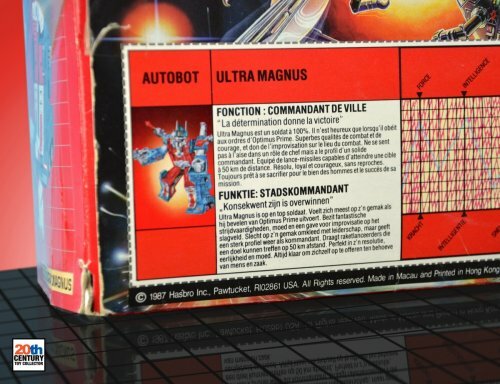 MB used a different product and assortment number scheme than Hasbro, so Ultra Magnus’ number is different from the one on the English only US packaging. 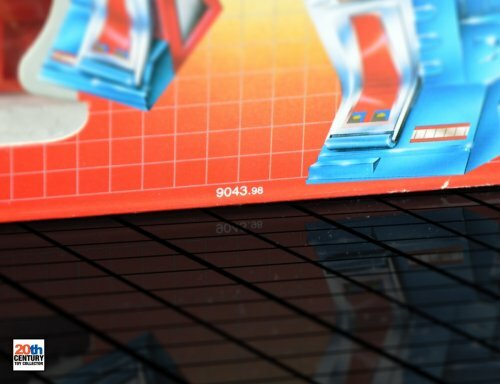 From what I’ve been able to decode while looking at MB assortment and product numbering codes, 9043 indicates the assortment or box/factory case number, while a value of 98 indicates this toy is the only one being shipped in this box (i.e. not an assortment of various toys grouped together in a factory case). It is used for bigger toys like Optimus Prime, Jetfire, Shockwave, Megatron, etc. 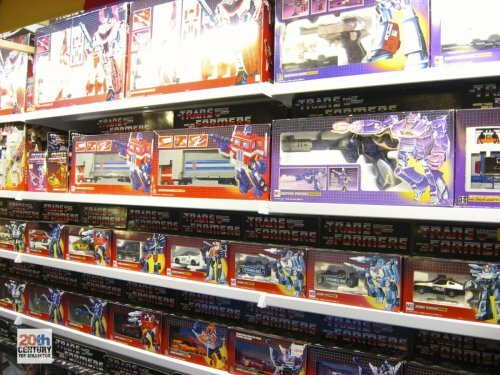 More Transformers related posts coming soon (wonder if I should rename this site ’20th Century Transformers Collector’…. LOL). Much better! 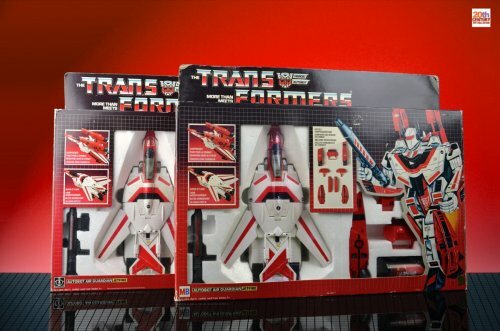 I did need to plunk down around 320 euros for the privilege of owning this one, but Jetfires with sturdy and structurally still solid packaging don’t come around that often, let alone specimens inside MB packaging. Boxes often show lots of wear and tear, especially at the bottom left where the MB or Hasbro logo is located. I’ve seen so many examples of Jetfire boxes with a tear right at that spot. 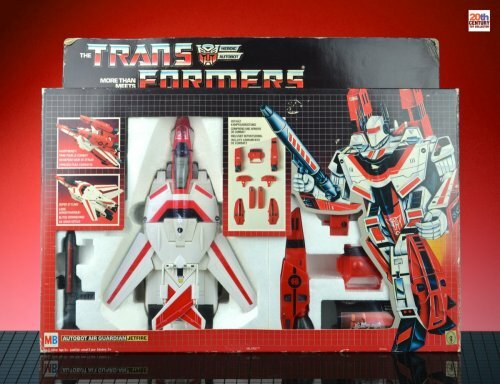 As has often been discussed on this website Jetfire was originally billed as leader of the Autobots in continental Europe when Transformers were introduced here in 1985. The reason why MB made Jetfire leader was that the exclusive rights to the Optimus Prime toy were held by a French toy company called Ceji, so MB couldn’t release Optimus Prime as a Transformer. Not too long after the launch of Transformers in Europe a deal was worked out with Ceji, which allowed MB to release Optimus Prime after all. An interesting piece of historical trivia and if you’re really interested in the dirty details you can read about that story here. Read more on this 1986 European re-release in an article I wrote about it last year here. 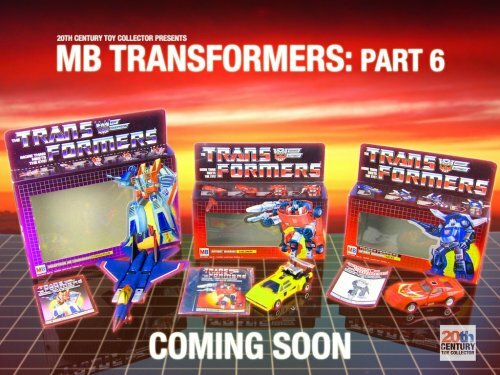 About a month ago I published the 6th chapter in an on-going series of articles on MB Transformers (of what will hopefully become a 10-part series). 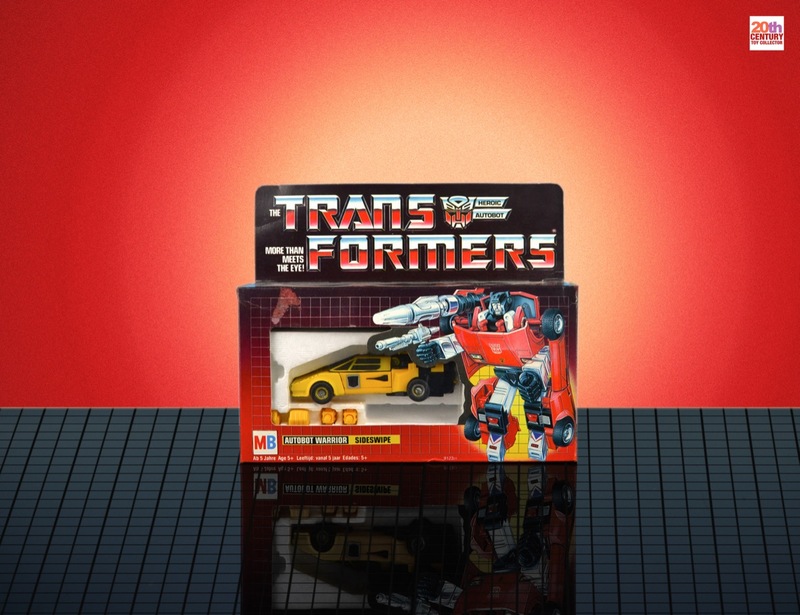 One major find discussed in this article was the discovery of the “MB Sunswipe”, a Sunstreaker that was sold inside Sideswipe packaging by MB. Crazy, right? While I had seen three examples of Sunswipes in the wild I did not have this packaging variant in my collection myself. And it wasn’t for lack of trying, because I had been searching for one for almost a year. The problem is you can’t just put any old Sunstreaker inside an MB Sideswipe box and call it an MB Sunswipe (well, not without it being historically inaccurate that is). 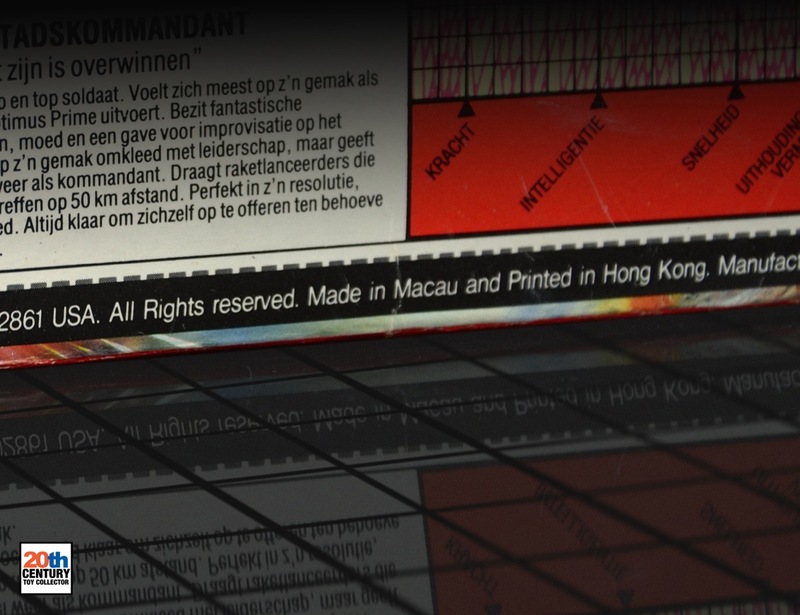 Because of its special origin (it was meant to be a Ceji Joustra Diaclone Countach) they come with a specific combination of copyright stamp and rubsign. Well, in an almost poetic fashion I got my hands on one. You see, after the article was published, someone on the TFW2005 boards recognized his loose Sunstreaker with Sideswipe stickers as being an MB Sunswipe! That was pretty cool. What was even cooler is that my friend Maz knew how desperately I wanted one and persuaded the owner to sell him this Sunswipe. Maz then sent it to me as a gift! Free of charge! For naught! It’s times like that, that I can get a little choked up inside. It’s heart warming to be on the receiving end of such sincere generosity. Maz, buddy, you rule! Thanks for this one. My own nice and shiny MB Sunswipe!! That’s it for now. Loads more acquisitions I made in the past few months that I’d like to feature here as soon as I get the time to properly photograph them, so stay tuned!! MB Transformers: Part 6 is here! Finally! 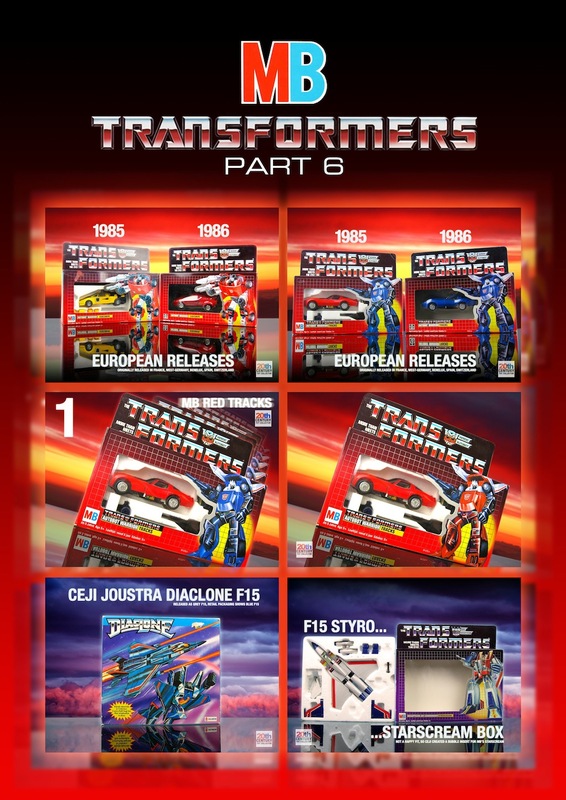 I can almost not believe it has almost been a friggin’ year and a half since I published the last chapter in my series of articles on vintage European MB Transformers. After months of hard work, especially the last few weeks, I can now finally chill out knowing the article is done. 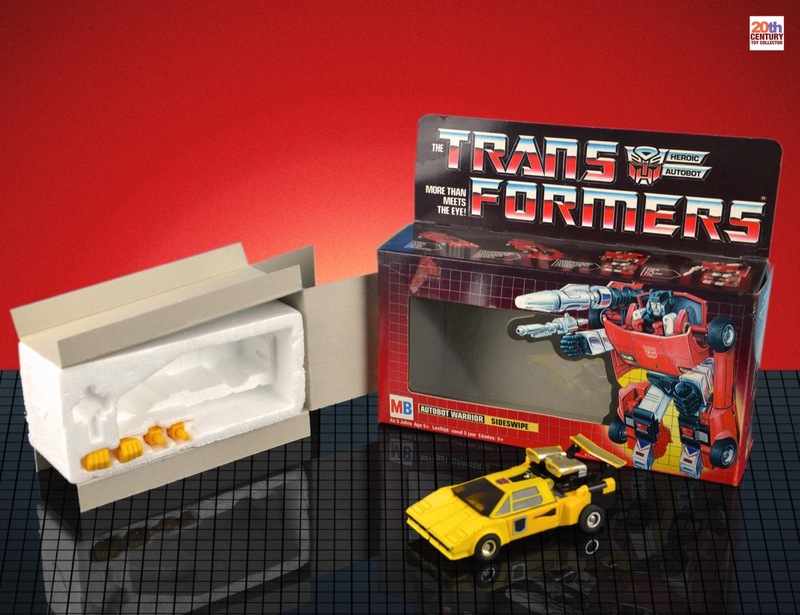 This particular chapter focuses on another interesting corner of the MB Transformers line: packaging mix ups! Of course, everyone knows about the Red Tracks packaging variation, but did you know there were two more? One of these was relatively known and one was almost completely unknown until now and it’s a doozy of a variation!! Some crazy stuff as you will see. Why did it take almost a year and a half for me to come up with the next chapter in this saga? Well, there are several reasons. First and foremost was the fact that I suffered a serious writer’s block after I had published the fifth chapter. I had spent so much time on it and just couldn’t bring myself to picking up my digital pen again for a while and when I finally did I had no idea whatsoever how to combine the stuff I was researching into the sixth chapter. I made several attempts that went nowhere. Lots of time spent with nothing to show for it kinda gets my morale down, but I guess that’s just normal. What also did not help is that one of the very subject matters I was researching had not fallen into place quite as much as I had liked to. Late last year I made a concentrated effort to finish the article by rewriting it from the ground up (again). But this time things were falling into place and the stars were aligning! This doesn’t mean it was smooth sailing from that moment on. It was a lot of work. I still marvel at the incredible number of manhours this article has cost me (and the two before it). I don’t have an accurate estimate of how much time it has cost me, but I think I prefer it that way, because if I did I would probably fall off my chair! One of the reasons why it takes so much time to create these articles is that I like to embellish them with as many photos and infographics as I can (–the poster above shows some examples of the graphical design that has gone into this chapter). This takes shitloads of time. Setting up my photo studio, photographing the items, breaking down the photo studio, importing the photos into Aperture and cleaning them up, then doing the Photoshop magic to sow everything together in a visually attractive way. I’d hazard a guess that more than 60% of the time spent on these articles goes into photography and graphical design. The stuff that I actually end up using is just a fraction of what I have been slaving away at. But in the end it’s worth it, because these articles would be so hard to digest and booooooooring without the visuals to hit things home. Of the five senses humans have, the largest part of the brain is reserved to process visual information. One photo or drawing can communicate in a split second the same amount of information that would fit into one or more paragraphs of text, which can take a minute to read and re-read (and sometimes still fail to bring the message across to the reader). Visual information rules! But I’m talking too much again. Please enjoy the sixth chapter in this 10-part series by clicking or tapping on the link below. It took a long time to write and it was a bumpy ride, but I think it turned out alright in the end. Enjoy!!!! To everyone who has been patiently awaiting the next installment of my article series on European MB Transformers, I’ve got some good news! The sixth chapter is now 99% complete. It’s currently being proof read by some people who are very knowledgable when it comes to the detailed and niche subject matter of this article. (That’s my safety net. It prevents me from staying stupid things in my articles). Then it’s just some last minute clearance I am expecting from several persons for the use of their photography or information and some finishing touches to the artwork and graphical design that I will be doing. If everything goes according to plan the article will go live right here this Sunday afternoon at one o’clock in the afternoon (Central European Time). Have a great weekend everyone!